Aborym were originally formed in Taranto, in 1992, by Fabban, then bassist in Funeral Oration and keyboardist for Memory Lab.The band started out as a covers band, playing the likes of Sepultura, Rotting Christ and Sodom, amongst others. Along with Alex Noia (guitars) and Mental Siege (drums), Fabban recorded the first Aborym demo, the five-track Worshipping Damned Souls, in 1993. The band split-up shortly afterwards, with Fabban pursuing his other project, Funeral Oration. Fabban, however, reformed the band in 1997, in Rome, with a new line-up containing Yorga SM on vocals and Davide Totaro Sethlans on guitars, who recorded Aborym's second demo (Antichristian Nuclear Sabbath) that same year.In 1999, the band struck a deal with the Italian Scarlet Records to release their first full-length album, Kali Yuga Bizarre. The album featured guest vocals from Attila Csihar, well known in the Black Metal scene for his work with Mayhem, Tormentor and Plasma Pool, who was to join the band full-time following the departure of Yorga SM. Around the same time, the band added a second guitarist, Nysrok Infernalien Sathanas, of the band Satanikk Terrorists. The album was well-received, with the caveat that was to become their trademark: one has to be open-minded when listening to it. Metallion, of Slayer Magazine, commented about the album:"Well, most of the Black Metal releases today don't rise anyone's attention, still there is a never-ending quest to find interesting bands. And this time we have come up with a winner. Aborym from Italy.This is what Black Metal should be all about. Ugliness, rawness, destruction, scary..."
In 2001, Aborym released their second album, Fire Walk with Us!, with Csihar fulfilling vocal duties and the band including a cover of Norwegian group Burzum's Det Som En Gang Var. The album was extremely well received. Terrorizer awarded it album of the month with a maximum score of 10/10, commenting:"Most black-heads will hate it, others will be curiously offended by it, and a fearless few will call it their own and use it as their very lifeblood. You can almost see the majority snicker at Aborym's psychedelic time-travel-meets-corpse-paint image, but these visuals serve to underline specifically where band and record belong: the outer reaches of the cosmos." The album also made Terrorizer's Albums of the Year for 2001, at position 39. Eduardo Rivadavia of AllMusic highlighted the potentially divisive nature of the record, stating: "Is it any good? Well, it really comes down to how the listener positions himself along the digital divide. Those who prefer their Metal stripped down and straightforward will likely find Aborym too Industrial and chaotic. Yet for fans of truly unique new directions in Metal, Fire Walk With Us is a full-course meal." Again, Metallion, of Slayer Magazine, said:"Aborym brought a new level of unexpected disturbance to Black Metal." 2003 saw Aborym release With No Human Intervention through Code666 in Europe and Mercenary Musik/WEA/Arista in the United States. The album continued to expand on the band's experimentation with Electronica, with Aborym citing influences from Drum 'n' Bass, Jungle, Techno, Classical, EBM and Industrial. The album featured guest appearances from Bård Eithun, Roger Rasmussen Nattefrost, Matt Jarman (of Void), Mick Kenney and Richard Szabo (of Timewave Zero). The album, again, achieved Album of the Month in Terrorizer, with Stuart Banks remarking: "With No Human Intervention shows a band pulling out all the stops to push the extreme and avant-garde to new depths and, quite frankly, making it look easy. Aborym have made Black Metal more than just relevant, they have given the genre a visceral vividness. Their ability to master forces of primitive rawness, cosmic elementals, cold machinery and ritualistic pounding, blending them into decadent layers of speed, dark grooves of hate and reality warping sounds which comprise this album, dismembers sanity”. Opinion, again, was mixed, however, with Dave Ling, of Metal Hammer UK commenting: "Aborym have somehow found a way of effectively mutating Black Metal's original strain with blasts of industrial noise and electronic effects." Nathan Pearce also said: "Aborym has solidified their sound and reputation with the release of the OUTSTANDING 'With No Human Intervention'. With the success of the genre defining 'Fire Walk With Us', Aborym was being looked to as the answer to the somewhat stagnant Black Metal scene. "Following the album's release, Aborym played at the prestigious Inferno Festival in 2004, with Eithun guesting on drums for the track Alienation of a Blackened Heart. In 2006,Aborym signed with a bigger label in the form of Season of Mist to release their fourth record, Generator. The band underwent further line-up changes, with Csihar leaving after seven years to return to Mayhem, and Seth moving to Sweden to join the reformed Dissection, and later Watain. Csihar was replaced by Preben "Prime Evil" Mulvik, previously of Mysticum and Amok, and for the first time the band employed a human drummer in the form of Bård G. Eithun, ex-drummer with Emperor and then of Blood Tsunami. Chad Bowar of About.com praised the album's atmospheric elements and the vocals of Mulvik, noting also that Csihar returns to appear on one track (Man Bites Dog). Jeremy Garner of Metal Reviews commented: "I'll be fucked if any Black Metal band tops this effort for a while. Any fan of Black Metal regardless of subgenre preferences should take the opportunity to delve into this. Pure excellence". Nathan Pearce of Ultimatemetal.com comment that: "Aborym is now a band that should appeal to a wider audience without alienating their already solid fan base”.In July 2007, Nysrok Infernalien Sathanas, Aborym's long-term guitarist, left the band, stating that his "approach to our way of working, living and thinking" was out of sync with the rest of the band. Mulvik also departed the band to concentrate on other priorities in his life. In 2010, Aborym became a trio: Fabban, Bård G. Eithun and new guitarist Paolo Pieri (stage name Hell:IO:Kabbalus). Recording the fifth album commenced on February 20, at Fear No One Studios, under the supervision of sound engineer Emiliano Natali. The band announced that the album would consist of a single track, which they described as "a harsh sonic monolith of sickness and depravity". The album featured sound consulting by Marc Urselli Shrarer at Eastside Sound Studios, New York. As usual, the album was announced to be featuring a number of guest appearances, in this case Narchost (of Fabban's other band, Malfeitor), Karyn Crisis (Crisis), Davide Tiso (Ephel Duath), Marcello Balena, and Richard Szabo (of Timewave Zero), amongst others yet to be revealed. In August 2010, Aborym announced that the title of the fifth album was to be Psychgrotesque and was to be released on November 8 in Europe (November 23 in the USA). The band described the album as: "a realistic story about the horrific human aridity and its fragile impotence. A social metaphor, uncomfortable but very current, treated cynically by bassist/singer Fabban through a story set in a mental hospital, which suggests that he used his pen with an absolute commitment and the determination to keep off Aborym from the banality and both ideological/aptitudinal and musical clichés that saturate the Extreme Metal scene". Alex, from Archaic Magazine commented: "The very aptly named 'Psychogrotesque' once again manages to make most Black Metal acts sound like Lady Gaga: the suffocating levels of abject perversion are scarily palpable, drenched in truly malignant horror and overt twistedness”. Peter Loftus, from Norway's Eternal Terror, said: "There is so much to love here, and it speaks lots that such an intense and insane album can be crafted to have such a wide appeal. Definitely recommended”. Pier Marzano of Italy's Grindzone wrote:"Citare se stessi è un lusso che si concede ai soli maestri del genere; reinventarsi pur riferendosi palesemente al proprio passato, non ha prezzo. Imperdibili, anche questa volta". Aborym will enter the studio In October 2012 Aborym entered the Fear No One studios to record their sixth album, the follow-up to Psychogrotesque. The new album will be released in early 2013 through Agonia Records. Title, track-list, guests and tons of important details about the new release will be revealed soon. The band is also working on a special song in order to celebrate the anniversary of the first 20 years of the band's career, an assembly of riffs, ideas, lyrics, loops and grooves sent by fans. Furthermore, a big fanwall poster is under construction, with hundreds of photos from the fans. You'll find all the infos and restrictions on sending audio and visual material inside the FanArea section, on www.aborym.it. In the meanwhile Fire Walk with Us is available on tape version with a refreshed artwork on October 21, courtesy of Virus Productions (Canada). In November 2012 the band signed a contract with Flaming Arts, a music management, booking and development company who represents and consults bands and musicians of extreme Metal. Founded in 2002 by Vadim Khomich the company started out as booking in the Russian states and quickly grew to the biggest booking agency in Russia for extreme music booking bands such as Papa Roach, Behemoth, Ill Nino, Cannibal Corpse, Chimaira, Sepultura, Within Temptation, Vader, Dismember, Dying Fetus, Cradle Of Filth, The Cult, Testament, Devil Driver and many more. Aborym will perform live again in 2013: they will treat their generations of fans in a must-see, heart-pumping eye-poppin’live shows. 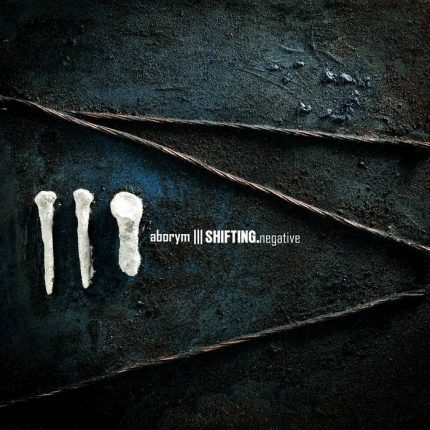 Album Review: Aborym - "Shifting.negative"